When it comes to Valentine’s Day you’ve got choices: flowers or chocolate; dine in, dine out; gourmet cuisine or home cooking. Whatever you choose, make sure you celebrate love with a safe and heart healthy meal. Follow these seven simple steps to keep your valentine safe and healthy while eating out. Assess the scene. Look for recent health inspection information and certificates that kitchen mangers are trained in food safety. Note whether the glasses, silverware, napkins, and tablecloths are clean. Know the facts. Look up the nutritional information in advance. Most major restaurant chains have this data online. Beware of sources of sodium. More than 40% of sodium we eat comes from these common foods: bread and rolls, cold cuts and cured meats, pizza, poultry, soups, sandwiches, cheese, pasta dishes, meat dishes, and snacks. Most restaurants offer lower sodium options for entrees and dressings, so check the menu or ask the staff for suggestions. Sharing is caring. Consider ordering one entrée to share. Many restaurant servings are enough for two. Get that doggie bag in the fridge—fast. If you’re not going straight home (within two hours of being served or one hour if the temperature outside is warmer than 90°F), leave the leftovers at the restaurant. This Valentine’s Day make the choice to lead a heart-healthy lifestyle. Heart disease causes one in four deaths in the United States. 90% of Americans (2 years and older) consume too much sodium. More than 70% of sodium that Americans eat comes from processed and restaurant food—not the salt shaker. Million Hearts® is a national initiative that has the goal of preventing 1 million heart attacks and strokes by 2022. 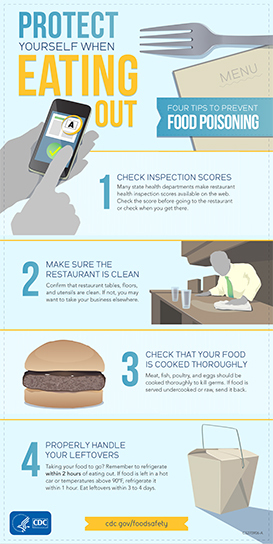 Follow these four tips to prevent food poisoning when eating out. Remember these seven tips for takeout, delivery, or preparing your sweetheart’s favorite home-cooked meal. Make recipes healthier. Look for healthy substitutions for saturated fats and trans fats in your favorite baked goodies. Choose lower-sodium options. Spice up your meal with seasonings and avoid prepackaged mixes that may contain a lot of salt (or look for low-sodiumor salt-free versions). Steer clear of frying. Opt for cooking methodsthat add little or no fat, like roasting, grilling, or steaming. Keep HOT food HOT! After food is cooked, hold it at an internal temperature of 140°F or hotter. Keeping food warm (between 40°F and 140°F) rather than hot encourages growth of germs that cause foodborne illness, also known as food poisoning. Use a food thermometer to make sure your meal stays out of the danger zone. Follow the two-hour rule. Throw away all perishable foods, such as meat, poultry, eggs, and casseroles that have been left at room temperature longer than two hours (or one hour if the temperature outside is warmer than 90°F). Continue the celebration. If your romantic dinner is just too big to finish, put the remainders in the fridge—and enjoy it within three to four days—or freeze it for another time.